I’m probably going to upset some people with my spelling here but as far as I can tell, there are two ways to spell the unicellular lifeforms most of use learn about in school: Amoeba and Ameba. I believe Amoeba is the more, shall we say, classical way of spelling the name but Ameba is also acceptable. I tend towards using Ameba because I’m lazy. On this occasion its useful to have two ways to spell the same word. What, you might be asking, has all this to do with software development? It contains all the skills necessary for under taking its task: developers, analysts, testers, what-ever. Ideally the team extends all the way into the business, there is no them-and-us divide. The team is responsible for its output. The team crosses the finishing line together - developers don’t win while testers lag behind, analysts don’t win while developers struggle too keep up, they win or lose together. Team and management should aim to minimise - even eliminate - dependencies on other teams. Work flows to the team. Teams start small and grow as they are seen to work. Initially teams may start understaffed, even with key skills missing, a Minimal Viable Team (MVT). The team may work on more than one product or project at one time - actually the concept of project should be avoided if possible. See #NoProjects - why projects don't make sense and #NoProjects becomes #BeyondProjects. Everyone aims for team stability: yes people occasionally leave and join but we aim for a stable team. The team can grow when there is more work and contract when there is less work. Growing takes time if it is not to undercut the teams productive capacity so needs to be done steadily over time. Shedding staff can be done quickly it is difficult to recover capability after the event. The teams historic past performance is used as a benchmark and to judge (velocity) how much work the team can take on and even forecast end dates. We start small and grow to work with, not against, Conway’s Law. If you start with a larger team, with more skills and roles defined in anticipation of what the team must then the software design is set by the team designers. 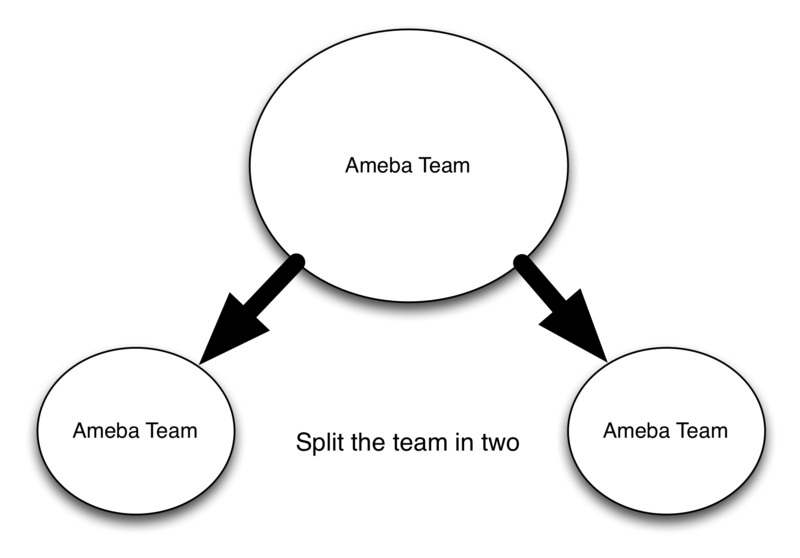 Although I don’t say “Ameba” explictly this is the thinking behind teams in Xanpan - and I promise to say more about Ameba teams in ‘Xanpan Volume 2: Management Heuristics” which I’ve now started work on. Yes there is a tension, a friction, here: I say you want a fully staffed team but I then tell you to have an MVT. Life isn’t easy! You start with an MVT and if they can produce something useful you decide what other skills they need and add them when you find the need. Larger teams can handle greater variability in workload and task variability and still have useful data. It is easier to justify full time specialists (e.g. UXD) on a larger team. Larger teams aren’t so susceptible to unexpected events (e.g. people leaving). Larger teams lose less of their capacity when they have a new person joining them. Once a team gets to a critical mass, say 14 people, then the team - like the creature - should split in two. The two resulting teams need not be equal sizes but they should each be stand alone. Each should contain all the skill necessary to continue their work. My thinking on team splits comes from reports of Hewlett-Packard I read a long time ago (and I’ve lost the reference). When a successful HP unit hit a particular size the company would split it in two so that each unit was manageable. The tricky bit is finding where to split the teams. We need to respect Conway’s Law. Ideally each resulting team would have its own area of responsibility. So if a large team looks after three similar products they might split into two teams, say 5 and 9 people each with the smaller team taking responsibility for one product while the larger team retains responsibility for the other two. What you must absolutely avoid is splitting the team so that one team now depends on the other. For example: one team is the UI team and the other the business logic. Shipping anything requires both to complete work. That means co-ordination, it means complication, it makes work for managers to do, it means expense and it means moving at the pace of the slowest team. Amoeba Management: Lessons from Japan’s Kyocera appeared in the Sloan Management Review in late 2012 - you can buy the article from Amazon too. You can find more information about it both on Wikipedia and on Kyocera’s website. And there is a book I’ve yet to read: Amoeba Management: The Dynamic Management System for Rapid Market Response. “Establish a Market-Oriented Divisional Accounting System: The fundamental principle for managing a company is to maximize revenues and minimize expenses. To implement this principle throughout a company, the organization is divided into many small accounting units that can promptly respond to market changes. Foster Personnel with a Sense of Management: Divide the organization into small units as necessary, and rebuild it as a unified body of discrete enterprises. Entrust the management of these units to amoeba leaders in order to foster personnel with a sense of management. They look very compatible with everything in Agile to me, they look compatible with Conway’s Law and Continuous Delivery too. There is also some hints at Kyocera’s accounting systems. They use a simplified system for transparency and leave details to teams. While this is a long way from Beyond Budgeting it does suggest, like Beyond Budgeting, that sophisticated long range budgets get in the way for actual performance. The article does point out that Amoeba Management, indeed any management approach, depends on the context. This is an important point that is often missed by Agile-folk, although one may forgive them as long as they confine their believe to software teams where there is a lot of shared context. Rather than go on about Amoeba Management right now I’ll let you read about it yourself - although that will cost, the article and the book. Although right I promise to return to this subject in the near future. Right now let me conclude with two thoughts. 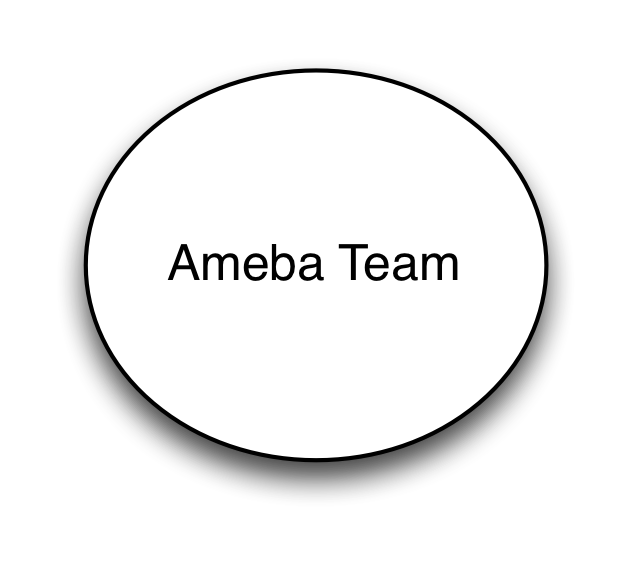 Ameba Teams (my ideas) share a lot in common with Amoeba Management (Kyocera), my thinking has been influenced by Amoeba Management but frankly I don’t know enough about them (yet) to speak with authority so I retain the right to define Ameba Teams in my own terms. While Agile and Lean people have been watching Toyota (the company that gave us Karōshi, death by overwork) another Japanese company has some interesting ideas we should consider. A few weeks ago I did a presentation entitled “Conway’s Law and Continuous Delivery” - although it was also at some point entitled “Conway’s Law and Organisational Change” or possibly “Conway’s Law and Change for Continuous Delivery” - to the Pipeline Conference in London. Since then the presentation has had a lot of interest on Twitter and on SlideShare - at one time it made the front page of SlideShare (my 15 minutes of fame I guess). Actually the Pipeline conference was the second time I’d made this presentation. The first outing was for the London Continuous Delivery group and hosted at the Financial Times. If you missed these two outings the good news is that the FT delivery was recorded and is available on Vimeo. This presentation is also on SlideShare but isn’t significantly different from the Pipeline version. I’m really grateful to Matthew Skelton, Steve Smith and Chris O’Dell who are the people behind both London Continuous Delivery and Pipeline. Although I’ve known about the idea of continuous delivery for a while I know much more and I’m really excited by it. Ever since then one of my mental models has been the organisation structure is the software architecture, I may no longer change code but by changing organizations I am practicing software architecture. Right now my head is buzzing with thoughts on Continuous Delivery, Conway’s Law, Team Structure, Scaling Agile and how this all fits with the Beyond Projects / No Projects agenda. I feel that if I can just make sense of all this I’m on the verge of some great breakthrough! Software Developers - programmers, testers, and everyone else - are what academics would call knowledge workers. We work with our brains rather than our brawn. We generate value because of what we know and what that knowledge allows us to do. This means those working in software technology - and particularly those developing software - have more experience and most history of using these tools, and consequently are the likely to be the most adapted to working with these tools. Our tools changed which allowed - even forced? - our processes to change. As knowledge workers outside of IT embrace these these tools its possible that their working practices will change in a similar way. My favourite example is a presentation given by Kate Sullivan at Agile on the Beach two years ago in which she described how the legal department at Lonely Planet adopted Agile. During the second half of last year I was involved with a client whose project was to write documentation. Specifications to be precision but not specifications for software - there was an element of that but that was not the aim. We used iterations, visual board and other techniques. We even used a walking skeleton. It worked. We delivered to schedule. The following is an except from my 2008 book “Changing Software Development: Learning to be Agile”. I’ve been thinking about this suggestion a lot recently and have a blog post in the works. Hence I thought now would be a good time to share this, it also means I can reference this post in the one that comes next… and who know, I might even rustle up a few sales for the book! Highlighting IT workers as knowledge workers allows us to learn from the existing body of knowledge on the subject. IT workers are not alone; they are knowledge workers and there’s much to learn from other knowledge workers, and from research and literature about knowledge work in general. There’s no need for IT managers (and writers) to re-invent the wheel. Yet, in another way, the existing literature, research and experience can’t help IT workers and their managers. This is because IT workers, and software developers in particular, are at the cutting edge of knowledge work. In many ways, they’re the prototype of the future knowledge worker; they’re pushing the boundaries of twenty-first century knowledge work. This occurs because, to paraphrase Karl Marx, software developers control the means of production. Modern knowledge work is enabled by and dependent on information technology: e-mail for communication, web sites for distribution, databases for storage, word processors for writing reports, spreadsheets for analysis – the list is endless! These technologies are created by software developers and used by legions of knowledge workers worldwide. The key difference between software knowledge workers and the others is that other knowledge workers can only use the tools that exist. If a tool doesn’t exist, they can’t use it. Conversely, software developers have the means to create any tool they can imagine. Consequently, it was a programmer, Ward Cunningham, who invented the Wiki. Programmers Dan Bricklin and Bob Frankston invented the electronic spreadsheet. Even earlier, it was another programmer, Ray Tomlinson, who invented inter-machine e-mail. This doesn’t mean that non-programmers can’t invent electronic tools. Others can invent tools, but for programmers the barriers between imagining a tool and creating the tool are far lower. Lower barriers mean that programmers create many more tools than other types of worker. Some tools fail, while others are very specific to a specific problem, organization or task in hand, but when tools do work it is programmers who get to use them first. In addition, because IT people have had Internet access for far longer than any other group, the propensity to use it to find tools and share new tools is far greater. So tools such as Cunningham’s Wiki were in common use by software developers years before they were used by other knowledge workers. Early Internet access has had other effects too: IT workers were early adopters of remote working, either as individual home workers or as members of remote development teams; IT people are far more likely to turn to the Web for assistance with problems and more likely to find it, because IT information has been stored on the Web since the very beginning. The net effect of these factors and others means that software developers are often the first to adopt new tools and techniques in their knowledge work. They’re also the first to find problems with such tools and techniques. Consequently, these workers are at the cutting edge of twenty-first century knowledge work; they are the prototype for other knowledge workers. Other knowledge workers, and their managers, can learn from the way in which IT people work today, provided that we recognize these workers as knowledge workers. From “Changing Software Development: Learning to be Agile” by Allan Kelly, 2008.